The Ordinary Life of an Extraordinary Girl: The second to last home football game - but who's counting? The second to last home football game - but who's counting? Two hours and 43 very long minutes. That’s how long I would have been outside in the freezing cold if I had seen the football game from beginning to end. Fortunately, for those stalwart fans who attended the entire game, the Longhorns were victorious over the visiting Bruins by a score of 27 - 13. Their record is now 4- 4 with two more games to play. I am so excited that the last game is at home in NOVEMBER – for this I will wear all my ski gear. Alex still had not quite mastered her “get the tee after the kick-off” job. First game, there was a 6 year old competing with her, and the second game was so tense (the big Homecoming Game) she missed her two opportunities. We are not disappointed, just curious, and we know sometimes we just have to wait for Alex time to catch up with ours. John has followed up with the Coach to see if there was anything we should be working on at home. He has been so great with Alex and explained they were practicing tee retrieval - but she needs to be comfortable running on a field with eleven charging adolescent boys. Coach told us they would keep practicing. So we continue to freeze and hope that it will happen soon. Strangely enough, for this second to last home game (but who’s counting) I had a conflict and did not get to the game until half time. This was very fortunate, because when I left after one hour and 43 minutes my toes and fingers were frozen. I was convinced I had frostbite. Thankfully, when I woke up in the morning all my fingers and toes were pink, and not black, or I would not be writing this now. 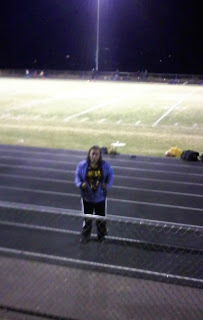 Much to her disappointment, Alex has to stay on the field when the boys go in the locker room at half time. Instead, she stands out in the cold and watches the Cheerleaders and the award-winning Dancers as they entertain the crowd. I’m sure she would prefer to be watching the football players – but rules are rules! Since I arrived at half time, I was able to talk to Alex. She told me that she had retrieved the tee twice. Based on the score, I quickly calculated this was a 50% success rate. Wondering about the other two – she told me she shared with the “little kid”. I am not sure that is the total truth – but I was not there. This was great news for me, and as I walked to the bleachers a few people told me that Alex had done a great job. Never, ever, had I imagined that I would beam with pride because one of my kids was able to retrieve a football tee during a High School football game – but I did! However, I was very disappointed that I had missed the excitement. As I made my way to the bleachers to wait for the game to start, I really hoped the Longhorns could score one more time so I could see Alex run after the tee. I was not disappointed. The Longhorns scored, Alex retrieved the tee, and I beamed and yelled with pride. It was worth the frostbite. As we drove home and I tried to tell Alex how proud of her I was, she blew me off. As far as she as concerned, that was her job and she did it. One more successful day in our lives as parents of this extraordinary child.